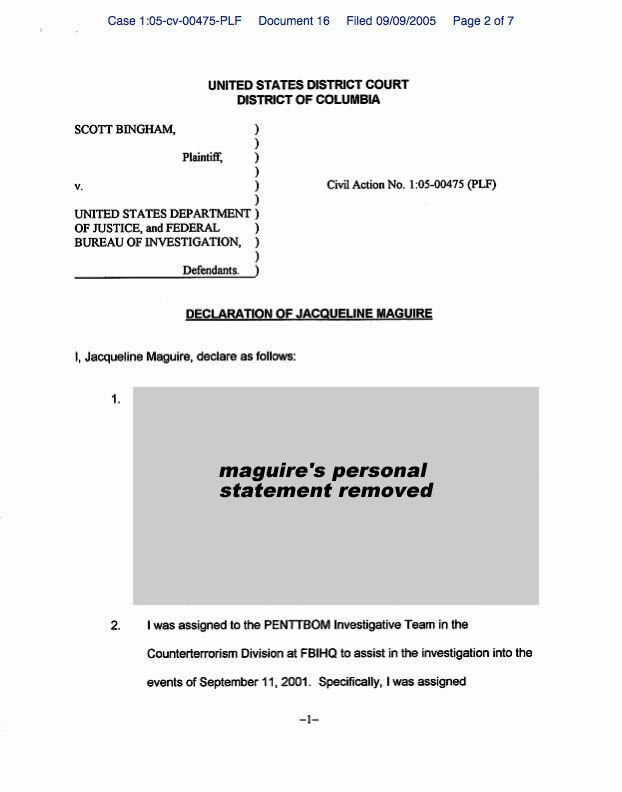 The videos taken from the Pentagon area after the 9/11 attacks were mentioned in the Maguire declaration, where FBI Special Agent, Jacqueline Maguire responded (see below) to a request from Scott Bingham. 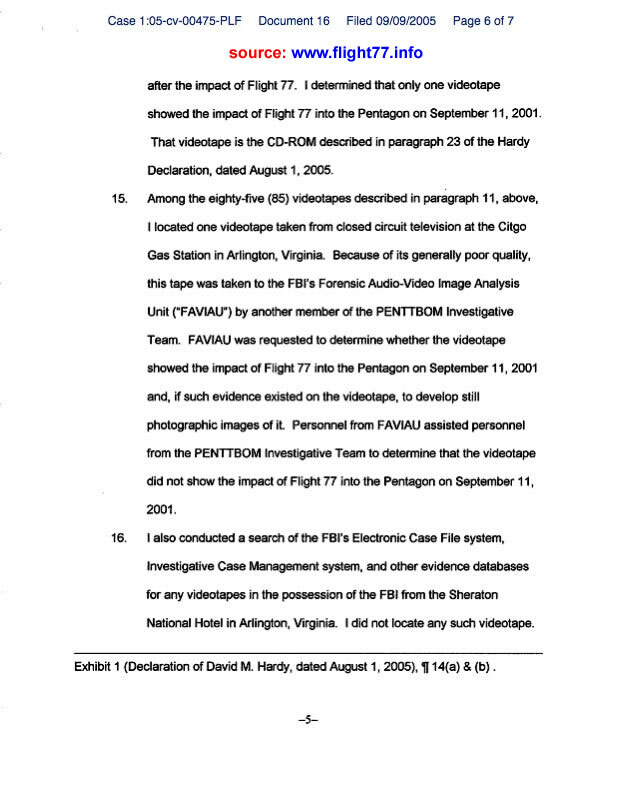 Of the 29 remaining videotapes, 16 "did not show the Pentagon crash site and did not show the impact of Flight 77 into the Pentagon." 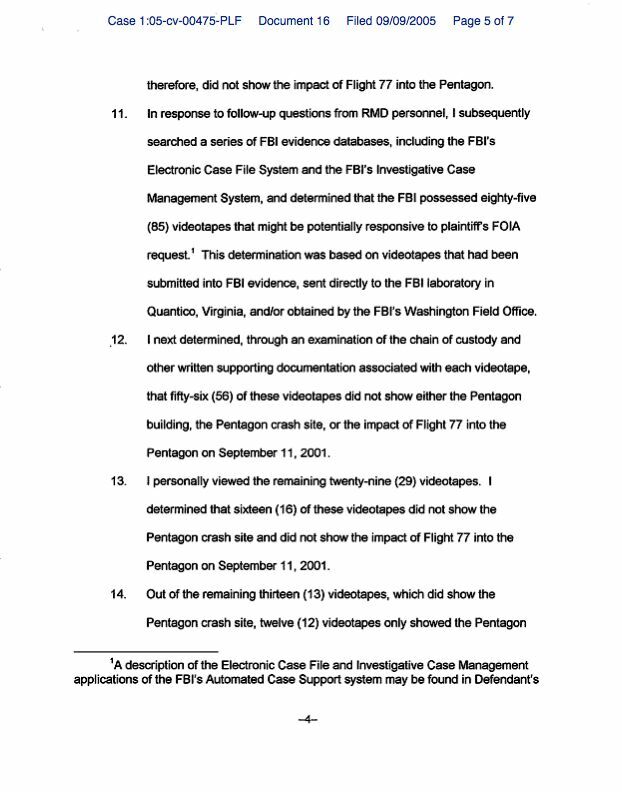 Of the 13 remaining tapes which showed the Pentagon crash site, 12 "only showed after the impact of Flight 77." 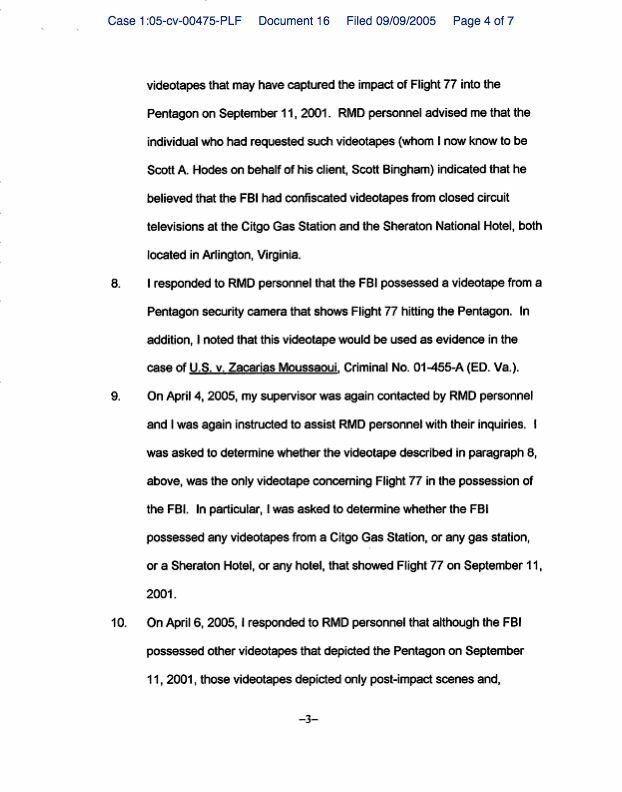 The videotape taken from the Citgo gas station did not show the impact. No videotapes were located from the Sheraton Hotel, though she located a videotape from the Doubletree Hotel. 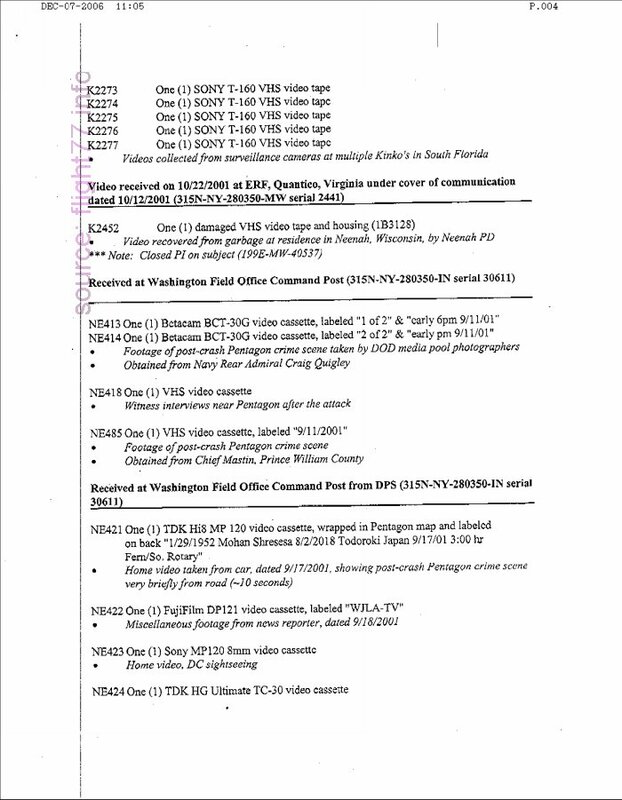 A list of all the videotapes is available, which shows many of these videotapes do not have footage of the Pentagon at all. Instead, many have footage of the WTC, some are security video tapes taken from a Kinko's in Florida, etc. 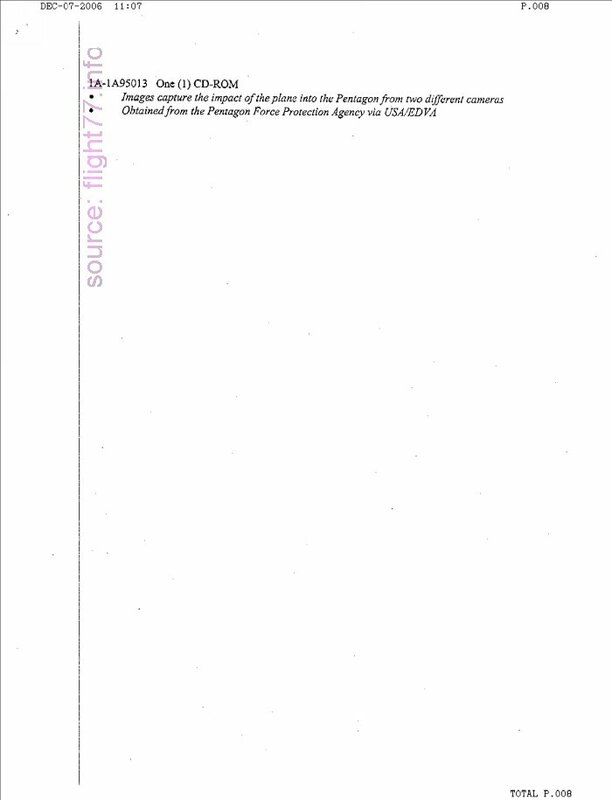 Some that show the Pentagon were taken days after the attacks, and some in the evening of 9/11/2001. 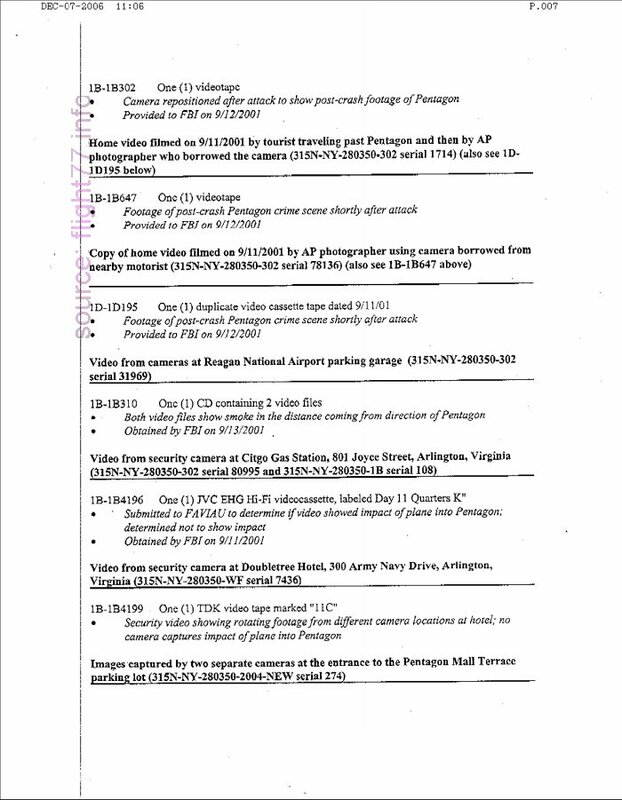 The security camera footage taken from around the Pentagon included the Citgo, the Doubletree, and the Pentagon parking lot. There was also video from cameras at Reagan National Airport parking garage. Both video files show smoke in the distance coming from direction of Pentagon. Another video came from a DEA HQ security camera atop 700 Army Navy Drive, Arlington, VA. The camera was repositioned after attack to show post-crash footage of Pentagon. Footage taken after the attack included home video filmed by a tourist traveling past Pentagon and then by AP photographer who borrowed the camera, and video taken by a NBC4 Washington reporter. 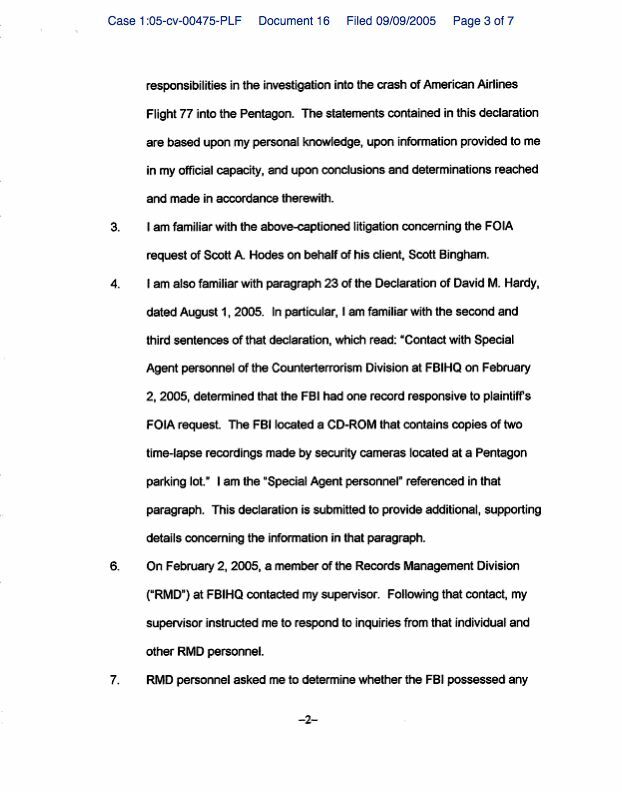 A complete list of the videos and original documents are below. 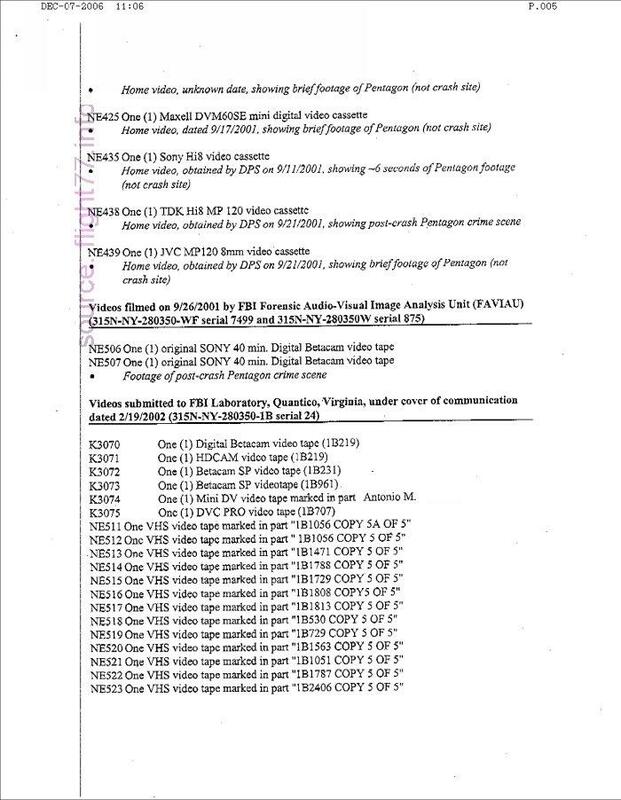 13 videos were obtained by the Defense Protective Services (DPS) - Pentagon Police - on 9/25/2001 from individual filming Pentagon site from Boundary Channel Drive. These included footage from the WTC site in the days after the attcks. 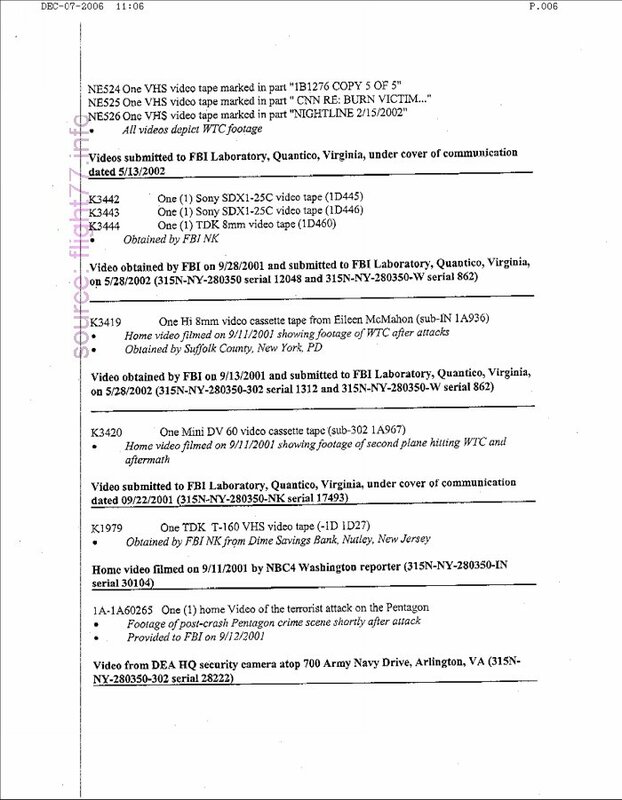 Videos received on 10/15/2001 at Quantico. These videos were collected from surveillance cameras at multiple Kinko's in South Florida. One (1) Betacam BCT-30G video cassette, labeled "1 of 2" & "early 6pm 9/11/01"
One (1) Betacam BCT-30G video cassette, labeled "2 of 2" & "early pm 9/11/01"
One VHS video tape marked in part "1B1056 COPY 5A of 5"
One VHS video tape marked in part "1B1056 COPY 5 of 5"
One VHS video tape marked in part "1B1471 COPY 5 of 5"
One VHS video tape marked in part "1B1788 COPY 5 of 5"
One VHS video tape marked in part "1B1729 COPY 5 of 5"
One VHS video tape marked in part "1B1808 COPY 5 of 5"
One VHS video tape marked in part "1B1813 COPY 5 of 5"
One VHS video tape marked in part "1B530 COPY 5 of 5"
One VHS video tape marked in part "1B729 COPY 5 of 5"
One VHS video tape marked in part "1B1563 COPY 5 of 5"
One VHS video tape marked in part "1B1051 COPY 5 of 5"
One VHS video tape marked in part "1B1787 COPY 5 of 5"
One VHS video tape marked in part "1B2406 COPY 5 of 5"
One VHS video tape marked in part "1B1276 COPY 5 of 5"
One VHS video tape marked in part "CNN RE: BURN VICTIM..."
One VHS video tape marked in part "NIGHTLINE 2/15/2002"
One (1) TDK video tape marked "11C"
Flight77.info was originally run by Scott Bingham, but he apparently lost interest in maintaining the site and the domain expired in Fall 2007. 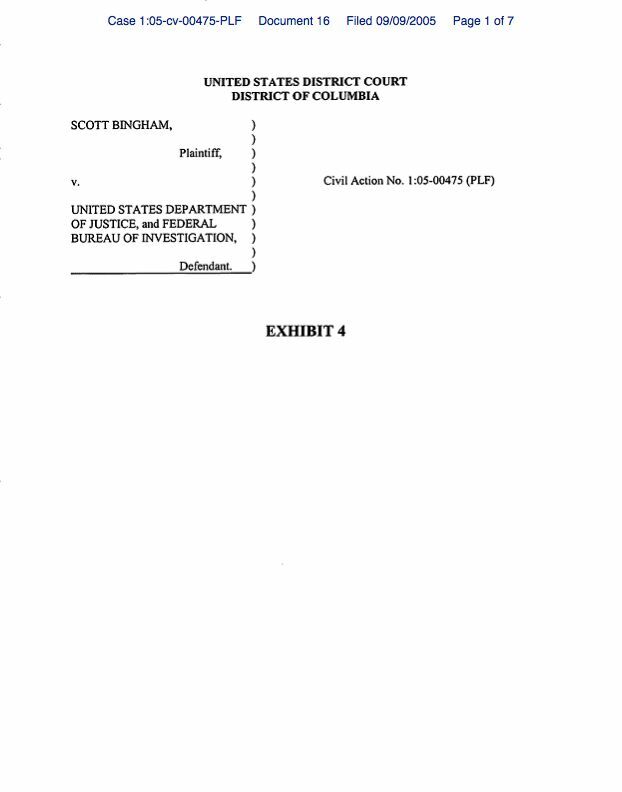 At some cost, I have obtained the domain so that the security camera videos from the Pentagon, the Citgo, Doubletree Hotel, and the related documents from the FOIA requests will continue to be here for the long-term. 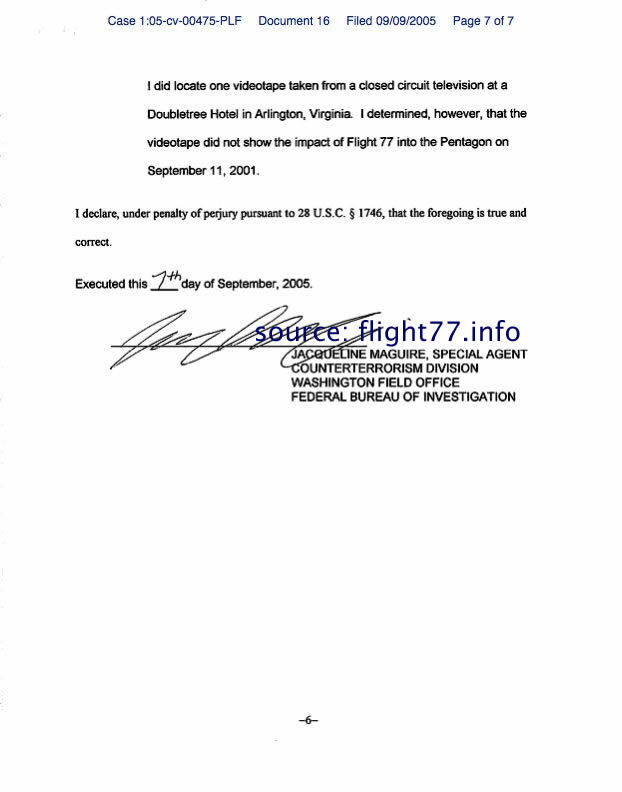 Photos and other information about Flight 77 are also here.